Stoops across the UK and Europe are hiding a secret: the ability to zoom right into the front door on wheels even though it’s located several steps above the sidewalk. And it’s about time. At this point in human history, with all the technology at our fingertips, there’s no excuse for failing to build accessibility into our environments. A company called Sesame Access makes that easier than ever with a variety of cool mechanized wheelchair lifts concealed within ordinary-looking staircases. 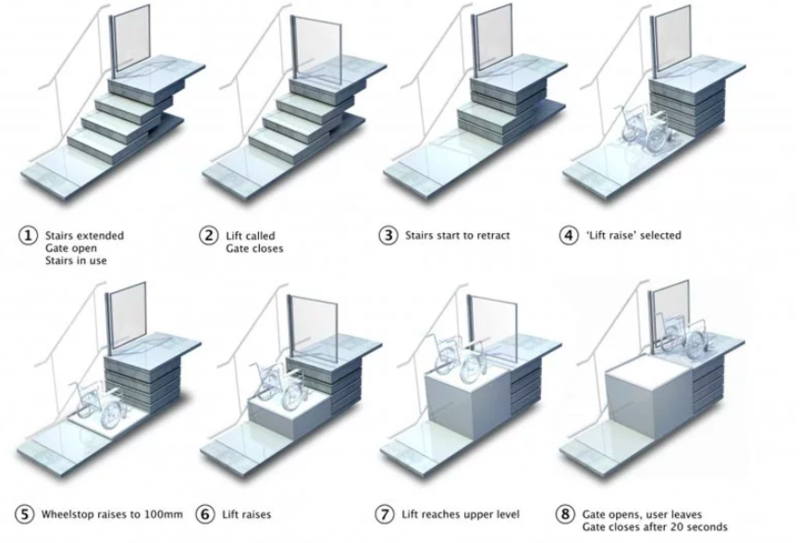 The company has installed hundreds of these lifts into all sorts of buildings and structures, from the Kensington Palace to Cambridge University. Many of the buildings in which the lifts have been placed are centuries old, with historic facades and entries preservationists hoped to keep intact. The Sesame retractible staircase blends so well, you can hardly tell the spaces have been altered to make it easier for all guests to enter autonomously. When the lift isn’t in use, the full width of the staircase is available for pedestrians. But if someone needs an alternative way to ascend, they simply push a button. The steps retract and a platform appears, elevating a guard rail to keep the guest secure while the platform rises. Sesame installs the mechanical elements of the system and leaves it up to the client’s contractors to clad the stairs however they wish, so they can get a perfect match to existing materials. To see how this looks across a wide variety of applications, check out Sesame’s case studies. It’s a pretty cool way to get around the common objection that a given location can’t be made accessible because of its historic or design value.